A second very quiet Black Saturday in France – but still very busy elsewhere. 10:30BST: as our traffic updates grow to take up three tweets it’s clear this is already a much busier Black Saturday than last weekend (when they all fitted into two). It’s not clear yet any records will be broken in France however – total jams stand at 400km, two thirds of last week’s total, with a couple of hours still to go before the (likely) peak. 07:00BST: there’s been a definite lull as day breaks – delays have come down (slightly) on the A75 south from Clermont Ferrand (pic Millau, above), the A7 to Avignon and the A8 towards Salzburg. Last week’s damp squib Black Saturday was partly attributed to so many drivers heading off overnight and it seems the same thing has happened today. It makes sense for many but a note of caution – a German family a few miles from their destination in north east Italy early this morning were involved in a head-on crash, apparently after driving all night. According to local reports, the mother was killed and the father seriously injured, but it seems the three children escaped with minor injuries, as did the three local women in the other vehicle. 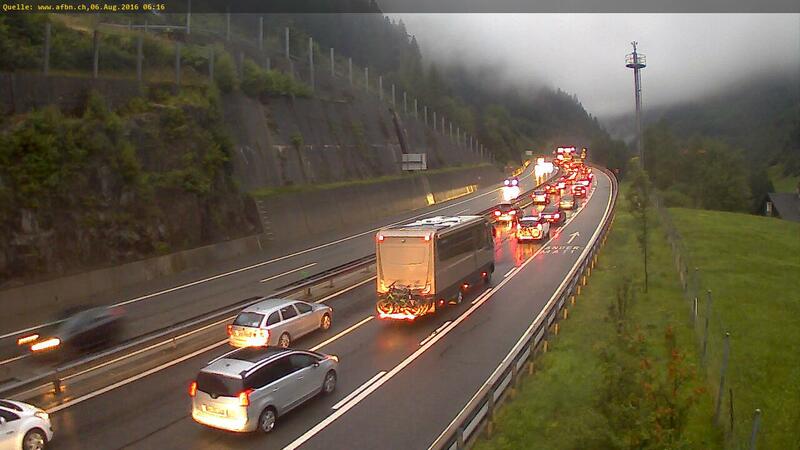 It looked pretty bad at the Gotthard Tunnel at 05:30BST – in fact, the delay southbound was only 30mins and it was clear northbound. Meanwhile there were no queues at all at the Mont Blanc Tunnel. It’s extremely doubtful that state of affairs will go on much longer but it does underline the fact that, even on the busiest days, there is a narrow window first thing when it’s possible to pass through without the typical multi-hour delays at most other times.